Luh loh(n) du grah(n) shuh-meh(n) [reh-leh(n), reh-leh(n)] Luh loh(n) du grah(n) shuh-meh(n). Ah loh(n) [reh-loh(n), re-lohm bruh soo [reh-loo, reh-loo] zuh(n) peh(n) [reh-leh(n), reh- leh(n)]. 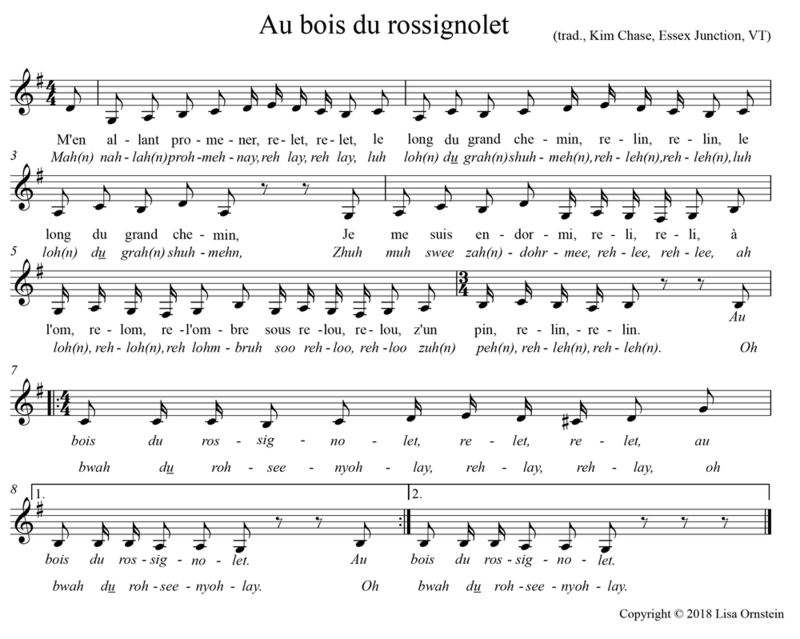 Refrain (x 2): Oh bwah du roh-see-nyoh-lay [reh-lay, reh-lay], Oh bwah du roh-see-nyoh-lay [reh-lay, reh-lay]. Ah lohm-bruh soo zuh(n) peh(n). Leh peh(n) [reh-leh(n), reh-leh(n)] ay-tay [reh-lay, reh-lay] fleuh-ree [reh-le, reh-lee]. Uhn flah [reh-lah, re-lah] zhoh-lay [reh-lay, reh-lay] oh-see [reh-lee, reh-lee]. 4. Ah! Sah-vay voo meh-syeuh [reh-leuh, reh-leuh] Suh kuh mah flut ah dee [reh-lee, reh-lee]? Suh kuh mah flut ah dee? La fee [reh-lee, reh-lee] duh soh(n) [reh-loh(n), reh-loh(n)] vwah-zeh(n) [reh-leh(n), reh- leh(n). À l’om- (re-lom, re-lom) bre sous (re-lou, re-lou) z-un pin (re-lin, re-lin). À l’ombre sous un pin. Le pin (re-lin, re-lin) était (re-lé, re-lé) fleuri (re-li, re-li). Un fla- (re-la, re-la) geolet (re-lé, re-lé) aussi (re-li, re-li). Ce que ma flûte a dit? La fille re-li, re-li de son (re-lon, re-lon) voisin (re-lin, re-lin). I fell asleep in the shade beneath a pine. In the woods of the nightingale, In the woods of the nightingale. 2. I fell asleep in the shade beneath a pine. I woke up, the pine was in flower. 3. Oh! I took my knife, I cut a branch. I made myself a flute and a whistle as well. 4. Oh! Do you know, kind sirs, what my flute said?